I always find that Penzance is a very underestimated town. 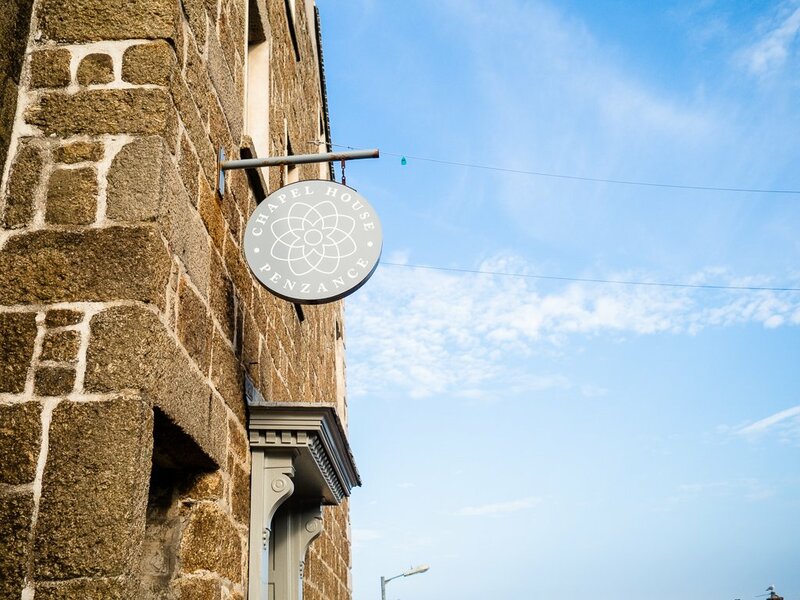 It hasn’t always had the best reputation, and yes, there are run down areas and a high street that could really use some love, but so much more to Penzance than just being ‘the end of the railway line’. I’ve always said that I rate the town for its awesome variety of independent cafes and restaurants, but there’s also the great selection of boutique shops and hidden gems down the side streets and around each cobbled stone corner. There’s the fact that when you look down any West facing street, you can catch glimpses of the sea and Mount’s Bay. There are the fascinating local businesses and art galleries (Penlee House and Cornwall Contemporary being the well-known ones, but plenty more smaller ones to explore around the town), and the STUNNING newly refurbished Jubilee Pool; Penzance’s Art Deco saltwater lido. 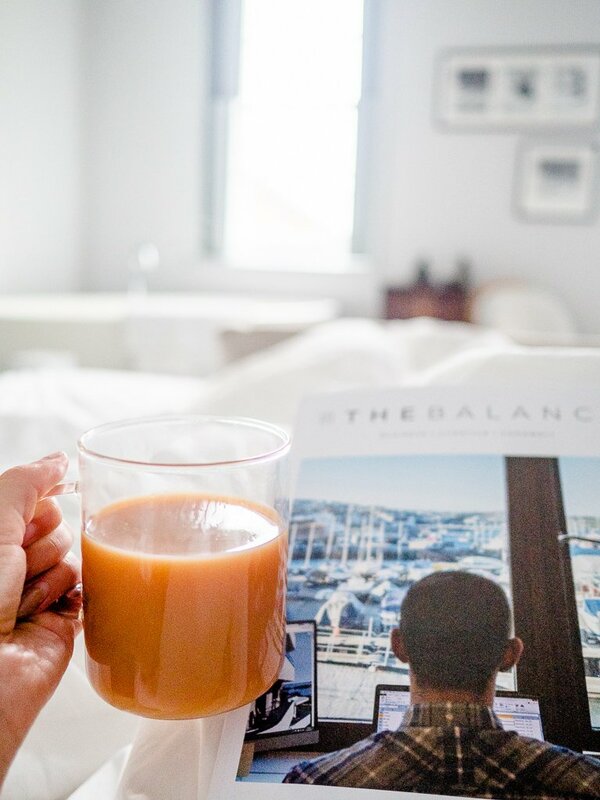 I am yet to visit but Sarah from Salt & Sea Stories always writes about it so beautifully on her blog – you HAVE to go see her photos of the place! Then there’s how close Penzance is to so many wonderful places! 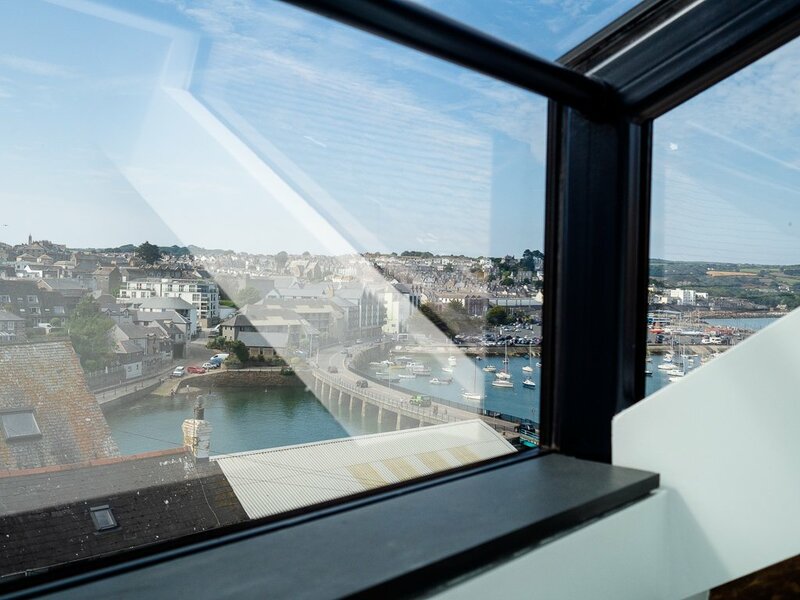 St. Michael’s Mount (Cornwall’s iconic island castle), Tremenheere Sculpture Gardens and the cultural seaside town next door that is Newlyn (famous for fresh fish and art galleries aplenty) are all within 5 to 10 minutes drive. Meanwhile, you’re also closer to the rugged and beautiful Penwith coast, with Porthcurno, Land’s End, Sennen Cove and Nanzijel beach all within 20 minutes drive too. 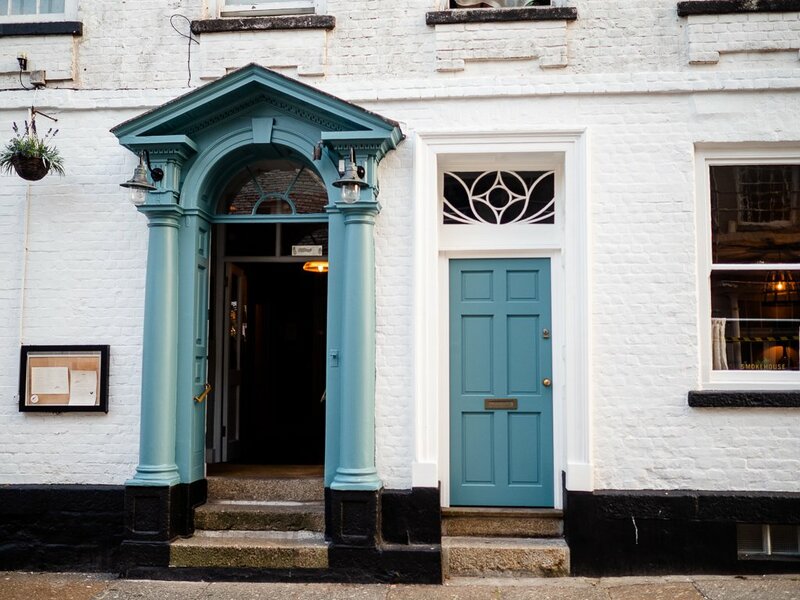 Situated on Chapel Street within the town itself (but just tucked away enough to be outside the hustle and bustle of the high street), Chapel House is a fantastic choice for your Penzance stay. 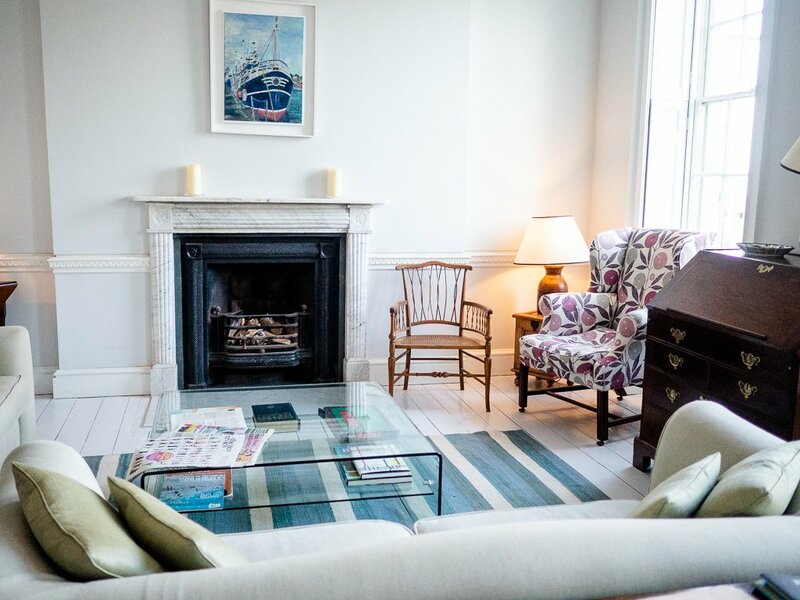 It’s a 6 bedroom luxurious boutique hotel within an 18th century Georgian townhouse that has recently been beautifully refurbished into a truly memorable space! 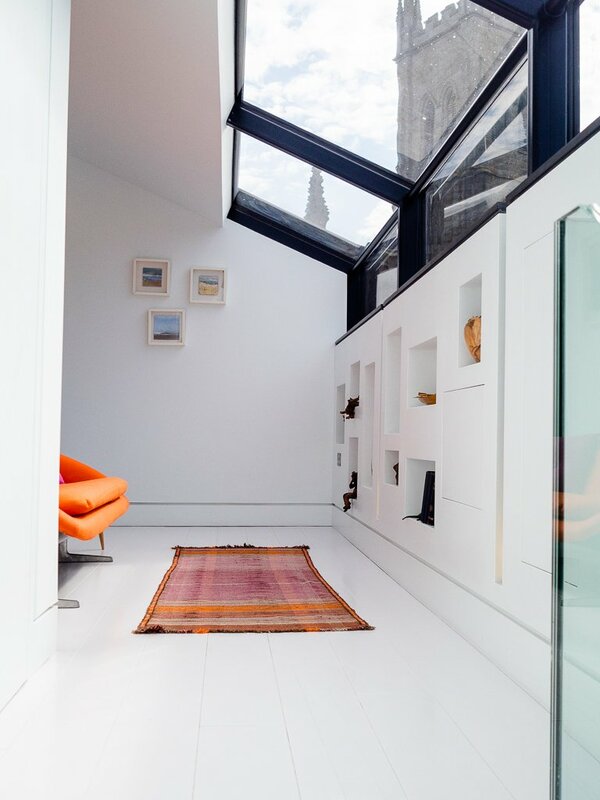 The house is designed to be more like a home than a hotel, with plenty of uniquely decorated shared spaces to explore across the four floors, including a large open plan kitchen dining area, a drawing room and lounge, an upstairs hideaway and a sunny outdoor terrace and garden too. 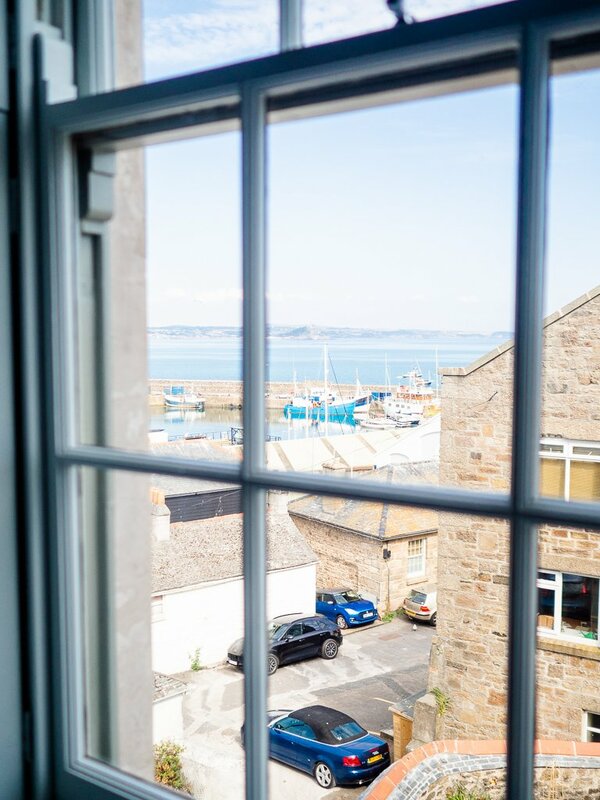 I loved that every window around Chapel House makes the best use of its views, giving glimpses of the ocean and harbour when you catch it from a certain angle. 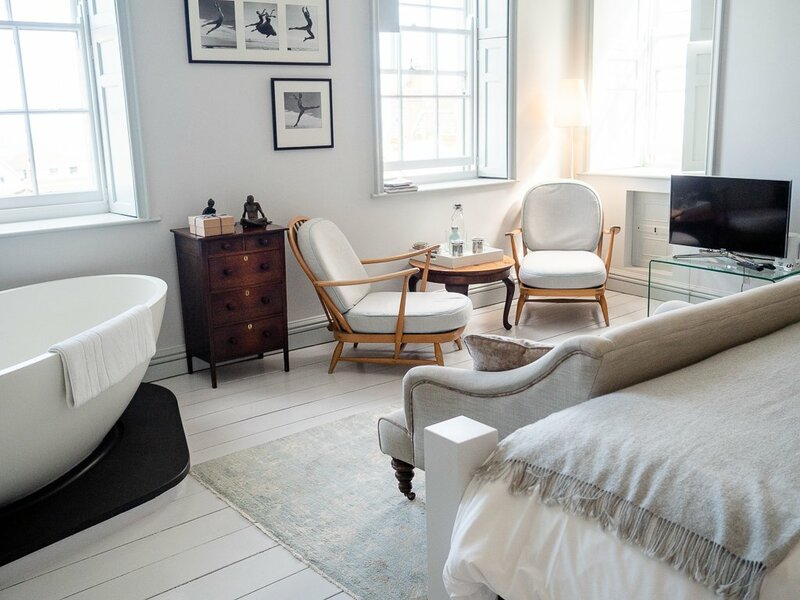 We were staying in Room 2; a light and airy space with its own marble fireplace and a stunning freestanding feature bath in the corner too. Decorated in white and soft greys, this room had my name all over, and felt completely tranquil and calming. 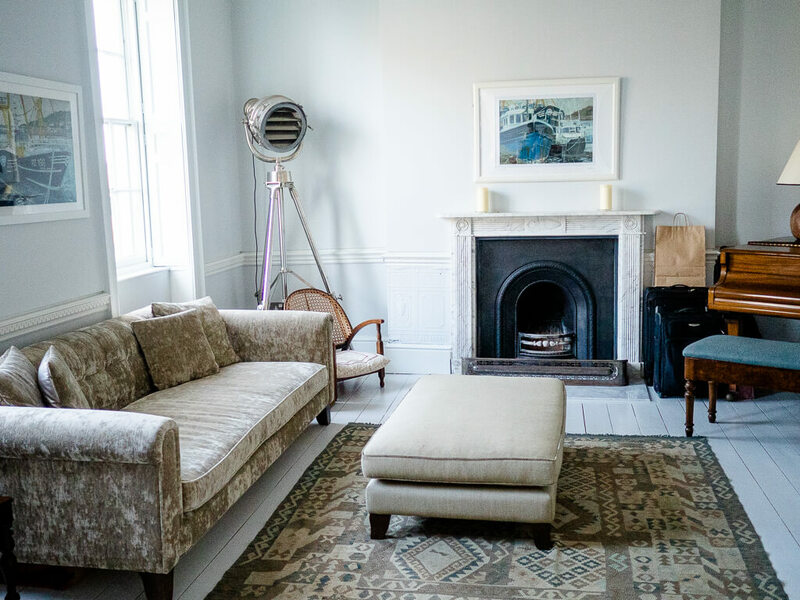 The finishing touches around the room were fantastic too; from fresh milk and loose leaf tea infusers, to dressing gowns and slippers ready for us in the closet, we felt right at home. 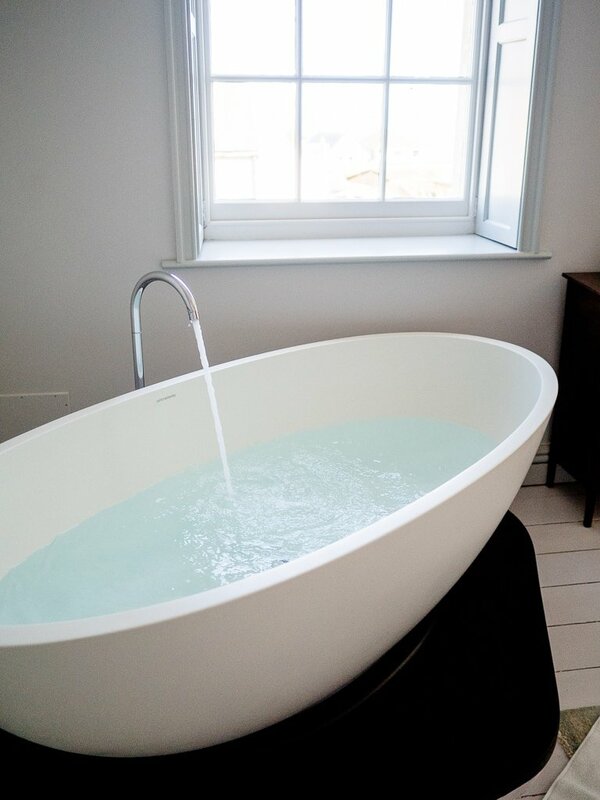 Of course the very first thing I wanted to do was have a bath in this gorgeous silky white tub! 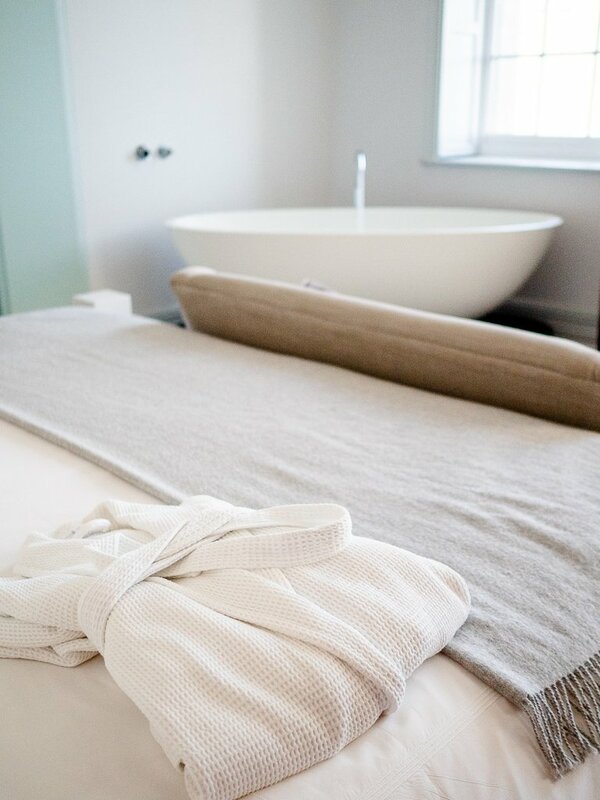 I’ve never bathed in an ‘in-bedroom’ bath before, and it felt like pure luxury, especially with the late afternoon light pouring in from the tall Georgian windows. Meanwhile, Alex made himself nicely at home too – we couldn’t miss the World Cup final, right? Thankfully, I could even watch from the tub! 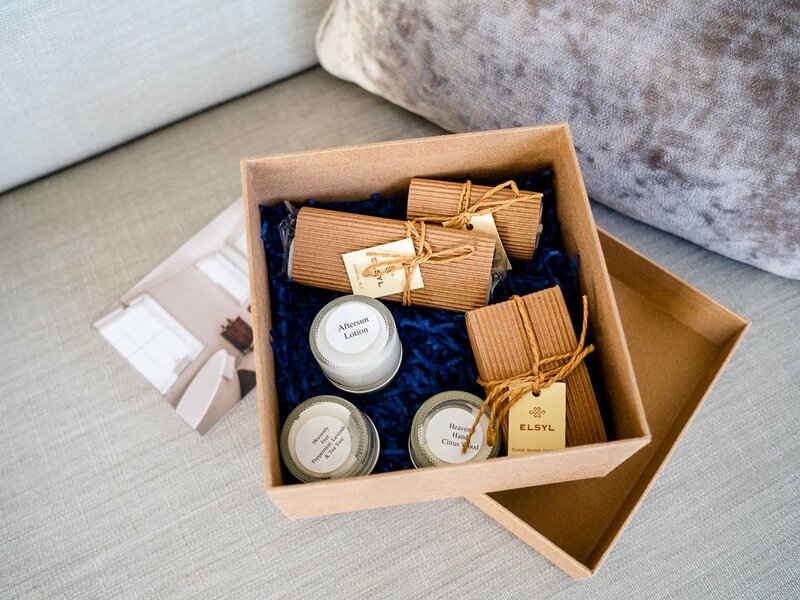 We were also given a sweet little gift box in our room full of deliciously scented lotions from Pure Nuff Stuff (a Cornish skincare company that I’m now totally converted to!). After my bath I showered off in the super-modern ensuite bathroom (complete with rainfall AND waterfall shower!) and treated myself to a sumptuous all-over body moisturise. Feeling suitably pampered, we then got ready to head down the road to the Cornish Barn for dinner. 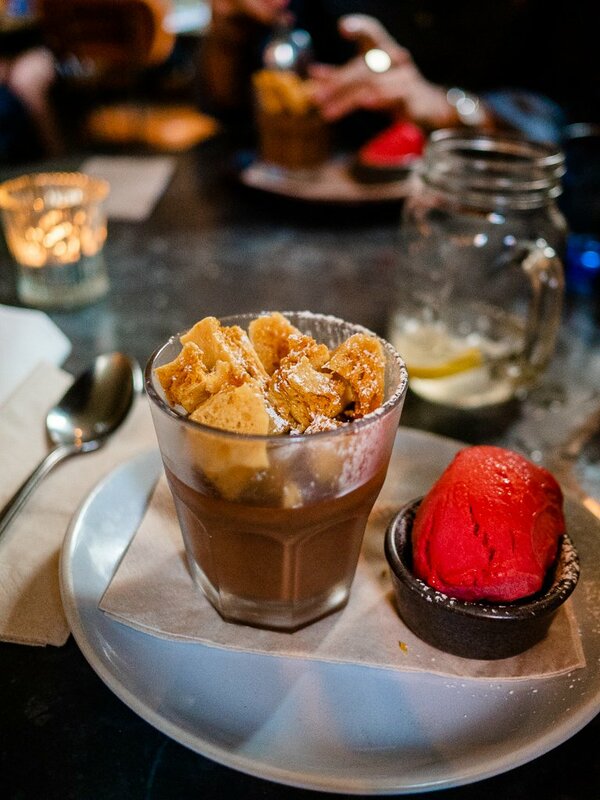 And when I say down the road, I mean literally 50 metres walk along Chapel Street – easy! 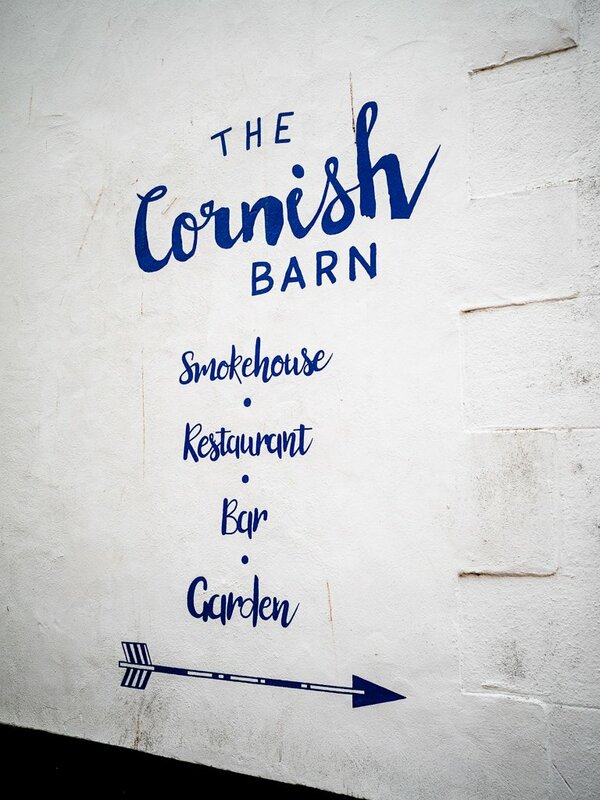 I’d heard about Cornish Barn on Facebook a few times; they’re often putting on feasting events, and it’s a top hang out spot in Penzance thanks to its quirky outdoor beer garden and terrace with cabana bar and table football. This evening however, we sat indoors amongst the rustic decor and ordered a couple of cocktails to get us started. 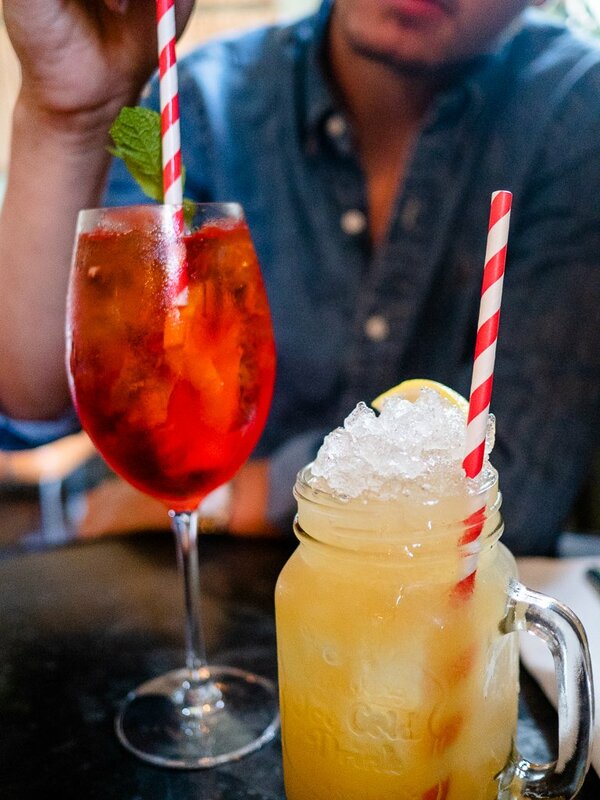 Mine was the Cornish Cooler, with rosé, vodka, peach, lemon and soda – delicious! 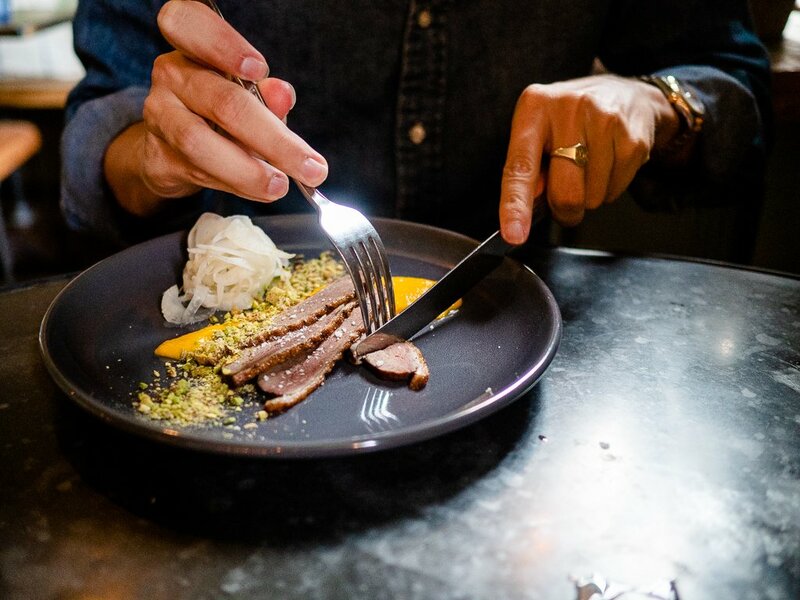 For starters I went for the squid, lime and chilli calamari, while Alex chose the smoked duck breast with carrot puree, pickled fennel and pistachio crumb. 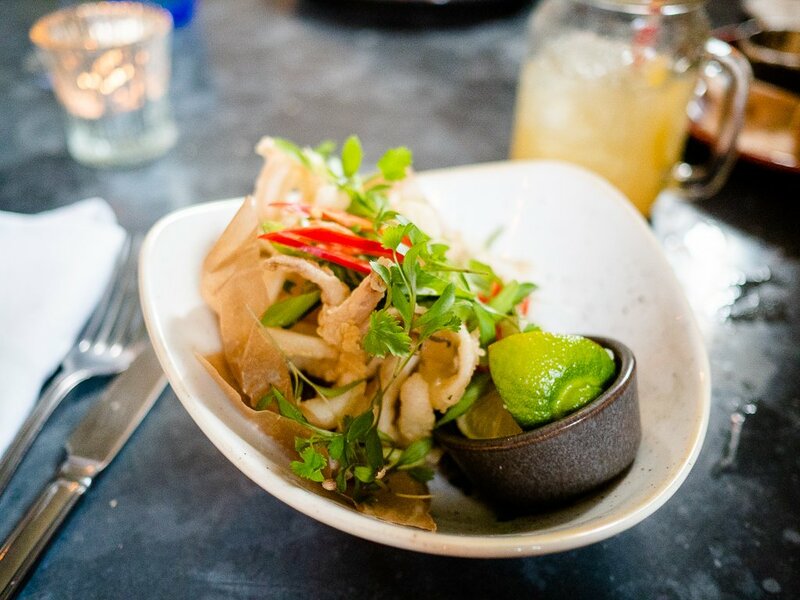 Let me tell you, it’s hard to impress Alex with food but he sang high praises for this dish! It looked super tasty and apparently the duck was perfectly tender too. 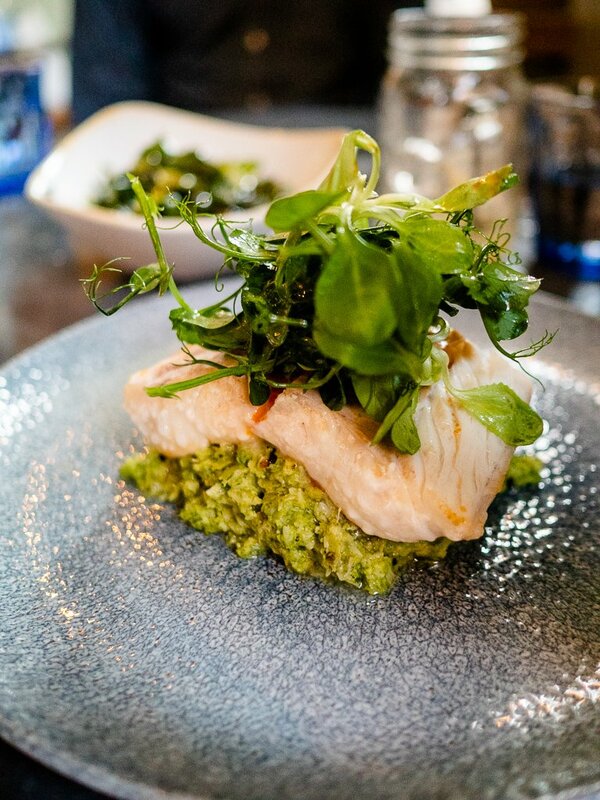 For main course we both went for the same choice from the specials board; cod fillet with a minted broccoli mash. I’ve never had a vegetable mash before but I thought this was great and will definitely be trying to recreate this at home! As you can imagine, after 3 courses we were pretty stuffed! We rolled back to Chapel House (thank goodness it was really just a few footsteps down the street!) and got ready for bed. 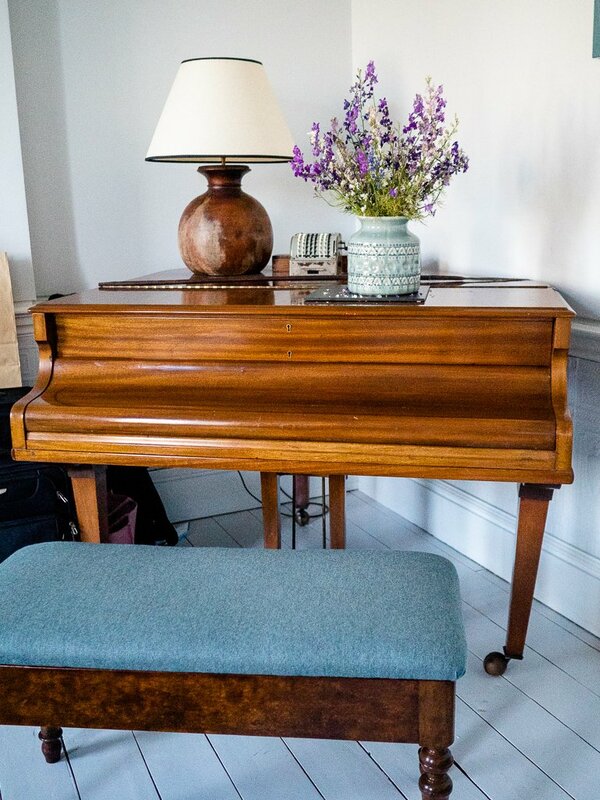 I had expected Chapel House to be rather plush from what I’d been told by others and seen online, but I hadn’t expected that every element had been deeply thought through and of the highest quality. The bed linen was the stuff of dreams; I honestly don’t think I’ve ever slept in anything so soft and silky. Apparently the same brand who supply her Majesty with linens, it was high grade 100% Egyptian cotton and felt just wonderful to wake up in. 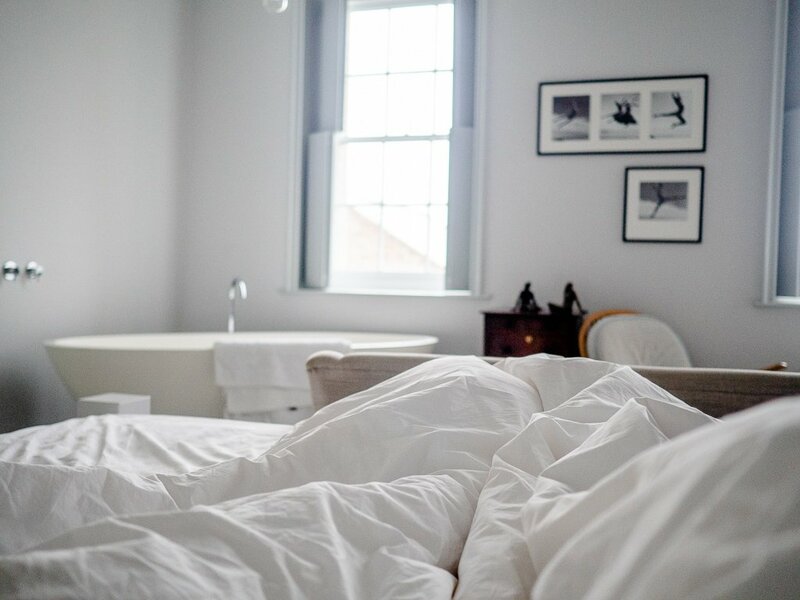 Nestled within the pure white soft sheets, as morning rolled around we opened the shutters and let the sound of seagulls and summer light stream in from outside, enjoying our last couple of hours in luxury before heading off to start the work week feeling refreshed! Is Penzance on your list to visit in Cornwall? 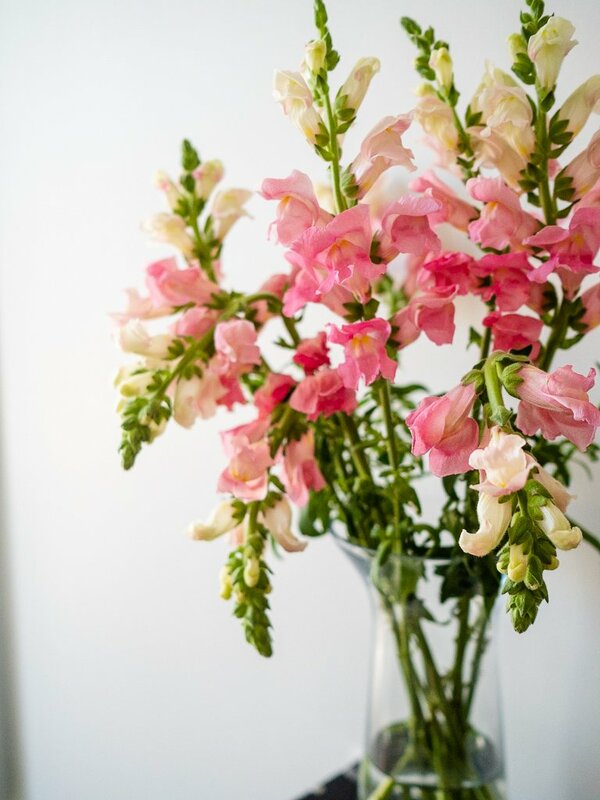 * We were invited to stay at Chapel House for the purpose of review, but all thoughts are my own.